It has taken the internet by storm. It’s vital, it can be viral, and it’s time to keep up with the trends and start focusing on video marketing. For small business owners, leveraging the power of video is important to achieve results online and increase website traffic. 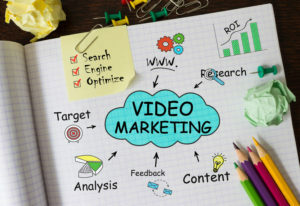 At Shamrock Communications, we’ve used the following video marketing strategies, we’ve seen them used successfully, and we’ve helped implement them. They work. Here are three tricks to help you build your brand and boost website traffic (the second secret is a no-brainer). Most likely you have a list of contacts. Treat this list like gold. From current clients to anyone who has expressed interest in your company in the past, if you’re not reaching them by email, you’re missing out. Text-based emails aren’t as effective as they once used to be. Want to stand out in a crowded inbox? Create an educational “how-to” video or invite them to learn about a difficult concept through an explainer video that’s hosted on your website. It’s a very simple way to increase click-throughs, get more replies and make your email marketing campaigns much more engaging. Episodic content (weekly or monthly topics and updates) resonates well with customers who are looking for progressive topics. Think about it. Most of today’s popular networks have built core content that has viewers anxiously waiting for the next release. How can you replicate this effect as a business? Create engaging videos that directly answer customer questions and address any issues to help build loyal brand relationships over time. But to increase website traffic, you need to create frequent video releases that deliver to audience expectations. Shooting multiple video segments in a day creates a video campaign that can be scheduled and distributed on a regular basis in newsletters, social media and websites. If you want to get website traffic, optimizing videos on YouTube for SEO is a must. Tag the video with the right keywords for Search Engine Optimization, include a link back to your website, write detailed descriptions of the product or service, include subtitles, write transcripts and give potential customers direction on “next steps.” Using all of these techniques will help to create a more interesting and engaging video that also gives you a better chance to rank for more keywords in search engines. Video marketing is an effective marketing tool and is only going to continue to grow in popularity and accessibility. Why? The answer is simple: Consumers like video. They use video. They remember video. And it gets great results. Find out how you can incorporate video into your next promotional campaign to drive traffic to your website. Contact our team with any questions today at 732-686-1140.